People think of Western Australia as very old because of the age of its rocks, but it also has a very active recent earthquake history. The information and links below provide information on what causes earthquakes and their related hazards. Read about Western Australia's earthquake history and see where earthquakes have been reported. Your observations of the effects of an earthquake can assist in determining the intensity and location of the earthquake. Observations can be reported to Geoscience Australia. Geoscience Australia undertakes a range of scientific activities, including natural hazard risk and impact analysis. It also has a section where you can monitor recent earthquakes. The United States Geological Survey (USGS) is the only Federal agency with responsibility for recording and reporting earthquake activity nationwide. Citizens, emergency responders, and engineers rely on the USGS for accurate and timely information on where an earthquake occurred, how much the ground shook in different locations, and what the likelihood is of future significant ground shaking. This site has excellent information. One of the most famous earthquakes in the recent history of Western Australia is the Meckering earthquake. It is not the strongest in Australian history, but it is significant in terms of damage done and subsequent cultural upheaval. At 10.59 am on 14 October 1968, the small town of Meckering, about 130 km east of Perth, was destroyed by an earthquake. Meckering's population at the time was approximately 240. Twenty people were injured, but incredibly no one was killed. The magnitude of the Meckering earthquake was almost seven on the Richter Scale, making it one of the largest recorded in the seismic history of Australia at the time. The earthquake was felt throughout the southern half of the State and caused damage in the surrounding townships, particularly York and Northam, and in the Perth Metropolitan area. The damage exceeded $5 million (in 1968 dollars). Images of the damage caused by the Meckering earthquake can be seen in the Geological Survey of Western Australia Bulletin 126, which also presents eye-witness accounts of the event. The earthquake and its aftershocks were accompanied by rupturing of the ground along a line about 37 kilometres long, over an area of about 200 square kilometres. The Meckering Fault was the first tectonic ground breakage to be recorded in Australia — the ground along the fault was heaved up to 2.4 metres, with a maximum vertical displacement of two metres and a maximum strike-slip or horizontal movement of 1.5 metres. Although most of the original scarp has now been smoothed over by agricultural work, some of the scarp can still be seen today on the ground and from the air (see images below; the view from the air is courtesy of Google Earth). 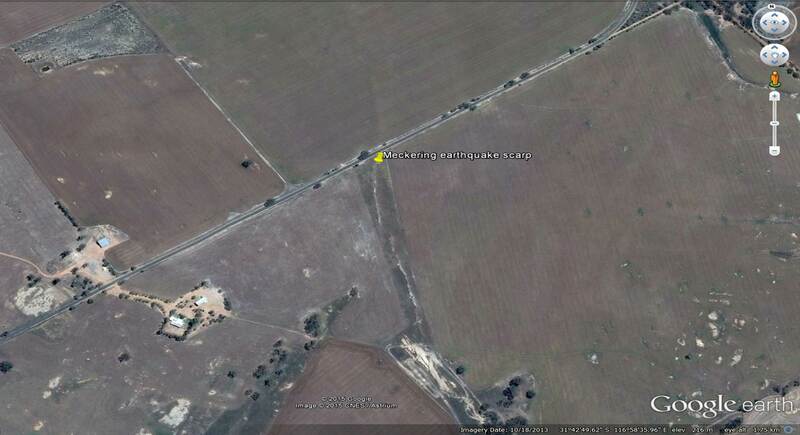 Google earth image of the north–south-trending Meckering earthquake scarp, viewed from an altitude of 1.75 km.